The Supreme Court has stayed the execution of the death sentence of Sonu Sardar, convicted and sentenced for killing five members of a scrap dealer’s family in Chhattisgarh. He had put forward a new plea that at the time of committing the offence, his age was 18 years and two months, based on information furnished by some student researchers of NLU-Delhi. A Supreme Court bench comprising of Justice Vikramajit Singh and Justice Shiva Kirti Singh has agreed to hear a plea against the procedure undertaken in naming Lt.Gen. Dalbir Singh Suhag as the next Chief of Army Staff (COAS). 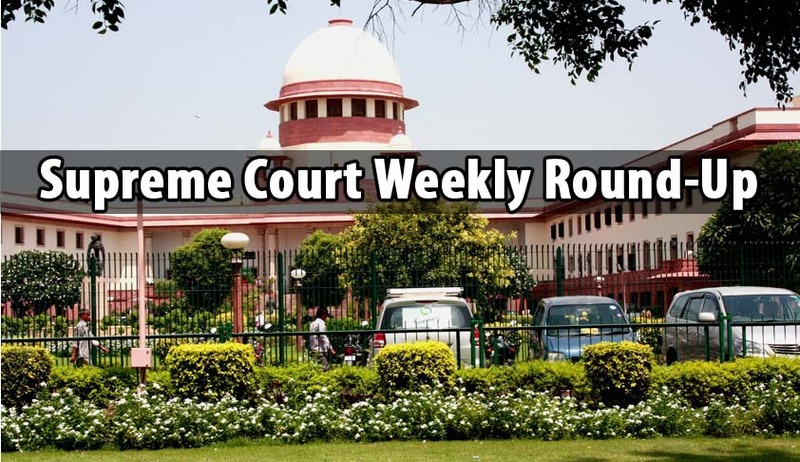 A Supreme Court Bench comprising of Justice Vikramajit Singh and Justice Shiv Kirti Singh has directed Bihar, Madhya Pradesh and Assam Government to extend the second round of counseling sessions for admission in post-graduate courses in medical colleges. The counseling is directed to be completed by June 23rd, so that the admission process including deposit of fess could be taken care of by June 25. The order didn’t extend to Gujarat and Maharashtra as their admission process was already over. Supreme Court Bench comprising of Justice Vikramajit Sen and Justice Shiva Kirti Singh fixed June 27 as the date for hearing the bail plea of Tarun Tejpal in the sexual assault case filed against him. Presently, Tejpal was on an interim bail for three weeks to attend his mother’s funeral rights. A Supreme Court bench headed by Justice Vikramajit Sen refused to hear a plea restraining N. Srinivasan from taking up the post of the chairman of ICC executive board, on an urgent basis. The Bench said that the case can be taken up after the vacation.